Bouncing Slime is the newest action game in pixel art from redBit games. This game is simple. A bouncing slime needs to pass all the colorful background levels in order to proceed. If you like big challenges confined in a simple manner, than this is the game for you. The gameplay is extremely simple at first glance, but in fact, as you go further the game, the levels become nearly impossible to pass. The bouncing slime travels through all levels and all you need to do is make sure the slime reaches the end of the line. By tapping the screen to jump on the platforms, you have to be careful not to fall or hit other obstacles such as spikes and fire flames in order to reach your destination. The game consists of 4 different worlds, with 10 levels each. As you go further, the difficulty increases, which means more short platforms and more obstacles on the way! In each world you’ll find a different background, along with gravity and speed shifts to make the game more difficult and fun! Any mistake results in instant death for the slime and a respawn at the beginning of the level. 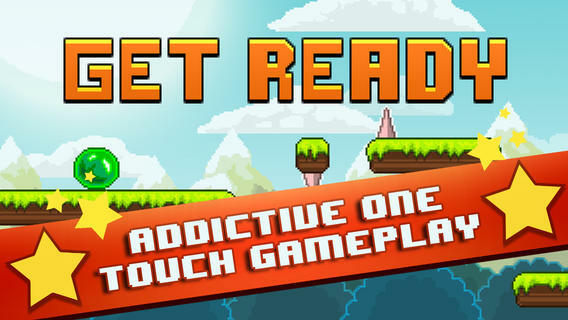 Play this new amazingly addicting game and challenge yourself to go all the way to the end!